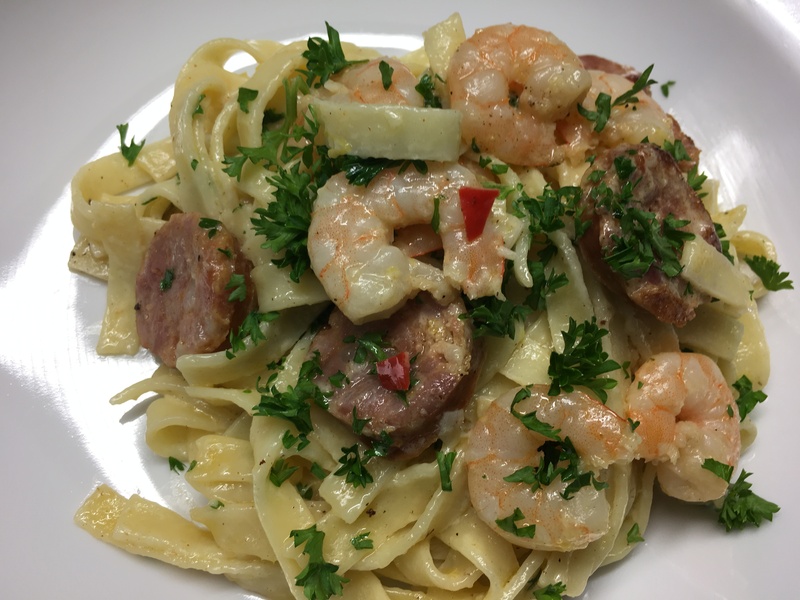 This recipe comes from my friend Ferne. She’s made it for me twice, once in Canberra and once in Brisbane where she now lives. Both times it was delicious. Any kind of pasta will work, but my preference is to use fresh fettuccine, sold in most Australian supermarkets in 375g packets. With a mixed salad and some fresh crusty bread, this recipe will serve 4. Cook pasta according to packet instructions then drain. Meanwhile heat butter in a large frying pan and cook pepperoni or chorizo for a few minutes, until starting to brown. Add prawns and garlic and continue to cook, stirring, until prawns turn pink. Add wine and lemon juice and cook over moderately high heat for 3-5 mins, to reduce the sauce by half. Add chilli and seasoning to taste. 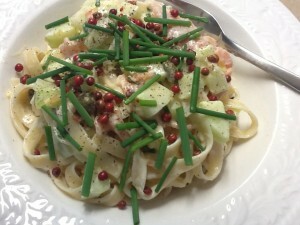 Mix in the cooked pasta, the parsley and cream. Divide between 4 bowls. Top with extra chopped parsley and drizzle a little oil around each serving. 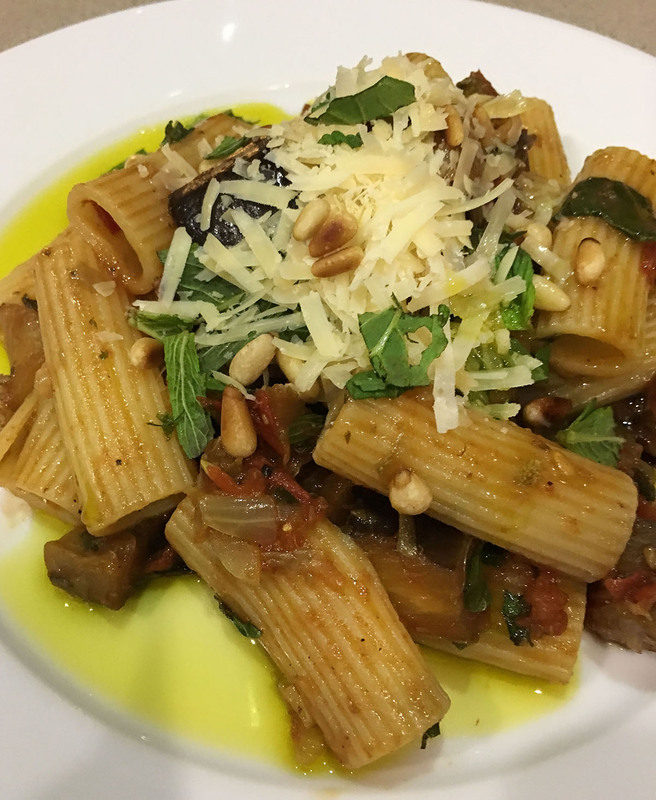 This recipe is adapted from one by Matteo Zamboni, who owns a restaurant in Sydney called Zambo. The recipe uses yabbies, a freshwater crustacean found in some parts of Australia. They’re not easy to buy in Canberra, so I used prawns instead. Zamboni uses Casarecce pasta, a shape I had never bought before, so I decided to try it and it was delicious. Use any shaped pasta that takes your fancy. What makes this recipe special is the stock, made from the heads and tails of the prawns. It uses the same idea as this recipe for Prawn Bisque which I have been making for years. The heads and tails of prawns are packed with flavour, so why throw them away? It’s a little more time-consuming than most pasta dishes, but worth it. Peel prawns and cut them into two or three pieces. Keep prawn heads and shells. Heat 2 Tbs of the olive oil in a large heavy-based saucepan. Add garlic and cook for a minute or two then add the tomatoes, prawn shells (not the actual prawns) and the stalks from the parsley. Cook, stirring for 3-5 minutes, then add the brandy and set alight. Finely chop the parsley leaves and keep aside. Add a little salt and just enough water to cover the prawn shells, then simmer gently for half an hour. While the stock is cooking, press down on the solids from time to time with a potato masher in order to extract as much flavour as possible from the prawn heads. Leave to cool a bit. Pour stock through a sieve, pushing down on the solids to get all the juices. Cook pasta according to packet directions in boiling salted water. In a frying pan heat the remaining 2 Tbs olive oil and cook the red capsicum, stirring, until softened. Add the prawn meat and cook, stirring for 2-3 minutes. When pasta is cooked, drain it then put it back in the pan with the capsicum and prawns and the prawn stock. Heat, stirring, until the stock has mostly evaporated. Add the chopped parsley and lemon zest and season to taste. 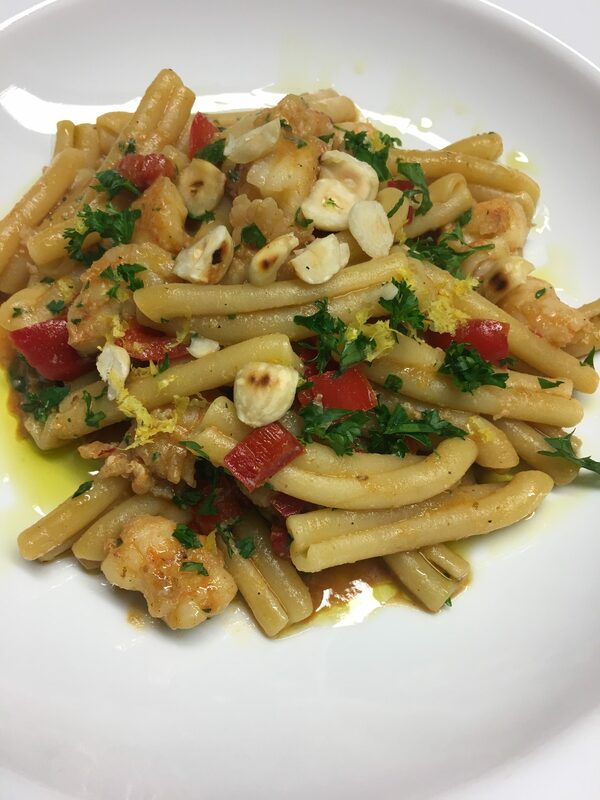 Serve pasta topped with the toasted hazelnuts and a drizzle of Extra Virgin Olive Oil. Don’t like anchovies? I have to admit I’m not mad about them either when they’re whole. But crushed into a sauce they add a unique depth of flavour which has been known to win over quite a few anchovy haters. A traditional Caesar Salad dressing wouldn’t be the same without them – but a lot of people wouldn’t even know they’re there. 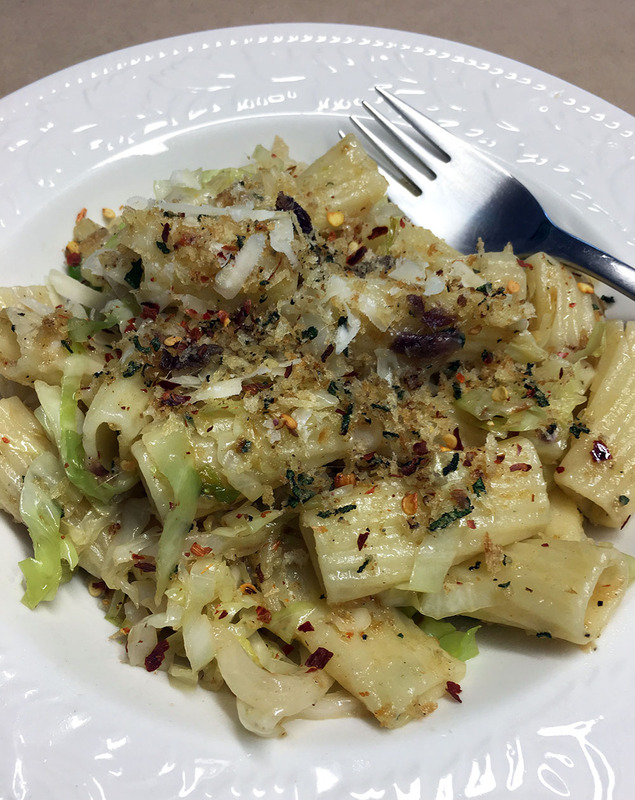 I found this recipe on the New York Times recipe site which said “Just don’t mention the anchovies, tell people it’s pasta, cabbage and umami”. This recipe is tasty on its own or as a side dish with grilled meat. Bring a large pot of salted water to the boil and cook pasta according to package instructions until al dente. Drain. While pasta is cooking, melt butter in a small frying pan and add half the garlic and the anchovies, mashing with a spatula until they dissolve into the butter. Add breadcrumbs and sage and cook, stirring, for about 2 mins or until golden brown. Turn off the heat and season with pepper. Heat oil in a large frying pan over medium to high heat. Add remaining garlic and chilli and cook for a minute or so, until fragrant. Add the cabbage and cook, stirring from time to time, for 15-20 mins or until it begins to caramelise. Mix with the pasta and breadcrumb mixture, saving some of the breadcrumbs to garnish. Check for salt and pepper and serve immediately, garnished with the remaining crumb mixture and the Parmesan. I’m always on the lookout for tasty new ways to serve pasta. 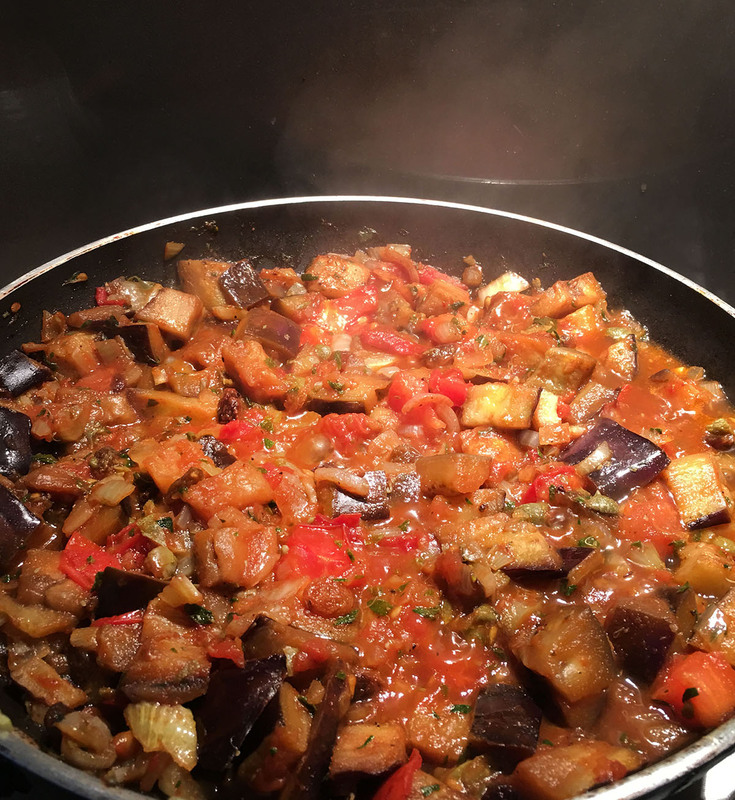 As we discovered when we spent a week there last year, Sicilian cuisine uses a lot of eggplant, one of my favourite vegetables. In this traditional Sicilian recipe it’s combined with tomatoes, raisins, pine nuts and capers. Two photos this week – one in the pan and one on the plate. Heat 1 Tbs of the oil in a large frying pan and cook the onion, garlic, chilli and marjoram until onion is soft, but not browned. Remove from pan. Add remaining 2 Tbs oil to the pan and cook the eggplant, stirring. When golden add raisins, tomatoes, tomato paste and sugar then return the onion mixture to the pan. Add the capers, vinegar and water, then simmer gently while you cook the pasta. If it gets too dry add a bit more water. Cook pasta until al dente. Season the eggplant sauce, then mix into the pasta. Serve topped with the pine nuts, mint, grated cheese and a drizzle of oil. Beef Teriyaki is one of my favourite stir fry recipes. There are other stir fries I’ve made once or twice, but I’ve made this one dozens of times. It’s quick, easy and adaptable – just as delicious at room temperature as it is hot. With the addition of lots of veggies, a small amount of beef goes a long way. Use Singapore noodles, Hokkien or similar. We find the amount of soy sauce is about right, but soy sauces do vary from brand to brand. If you find it’s a bit too salty make a note and next time use less soy sauce and make up the difference with water. Freeze steak a bit to make it easier to slice thinly. Slice downwards into paper thin strips. Dry well on paper towels. Heat oil in wok or large frying pan. Add meat and garlic and stir fry for 1-2 minutes over high heat or until browned. Remove meat from pan, leaving the oil behind. Add onion and stir fry 2 minutes, then add remaining vegetables except mushrooms and stir fry for 5 minutes or until al dente. Add soy sauce mixed with sugar and sherry. Meanwhile cook noodles in boiling salted water according to packet instructions. Return meat to pan with mushrooms and stir fry for 2-3 minutes. Fold through drained noodles and stir fry for about a minute. 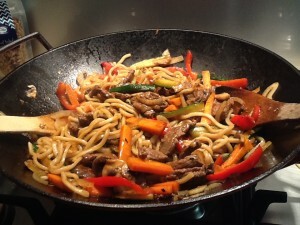 Note: if using dried noodles you will need only 125g and they will take longer to cook. If liked you can always add a touch of fresh chilli and substitute other vegetables such as broccoli, green beans, cauliflower or asparagus. I’ve been asked to write a guest post for Café Cat because Mum’s currently in Chile on a business trip. 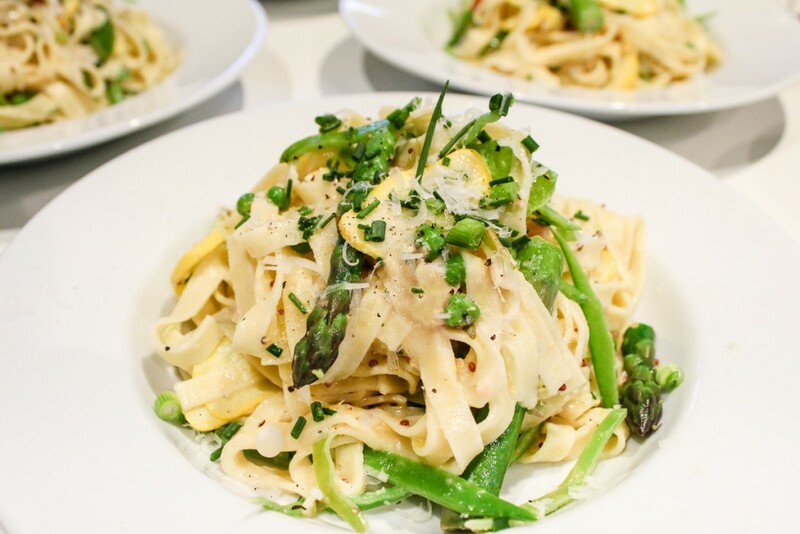 With a bumper crop of both broad beans (also known as fava beans) and snow peas in my garden, I thought I’d share a recipe for Fettuccine Primavera. As with most things I cook, this is a hybrid of recipes found online and from cook books, picking and choosing the bits I thought sounded good. Since making it last week I have cooked it again making a few variations, including adding smoked salmon, and will add it to our summer rotation as a delicious way to use any green legumes. Boil salted water for pasta in large saucepan. Fry garlic in olive oil before adding lemon juice, zest and mustard, combine before stirring through cream. Season to taste, then leave to simmer gently. Cook pasta as per directions. Two minutes before pasta has finished cooking, add vegetables to allow them to cook, but remain crisp. Drain and return to saucepan before stirring through sauce and half of the shallots. Serve with remaining shallots and sprinkle with cheese over the top. Smoked salmon is much cheaper than it used to be, especially if you buy it in half kilo packets, so I usually have some “on the go” in the fridge. It’s handy for creating a quick salad or pasta dish such as this one, slightly adapted from a recipe in Delicious magazine. Pink peppercorns, known as baies roses in French, are fragrant and only slightly peppery. According to Wikipedia, they are not real peppercorns but were so-called because they look like them. They go well with most recipes using smoked salmon or gravlax. You can probably tell from the photo that I only had chives and no dill, but it still tasted good! Sprinkle cucumber dice with salt and leave to drain in a colander for 30 mins then rinse and pat dry with paper towels. Cook pasta according to packet instructions, drain and mix with the oil. Mix sour cream, vinegar, garlic, lemon juice and rind, capers and herbs in a bowl. Then add pasta, cucumber and smoked salmon. Divide among 4 bowls and garnish with extra herbs and pink peppercorns or salmon roe. The dish will be warm rather than piping hot. Last weekend our friends Venessa and Tony gave us a packet of orecchiette pasta all the way from Italy, although they had bought it at the local deli. It’s shaped like baby pig’s ears, hence the name, and they said it was 50% nicer than any normal pasta. Last Sunday David Herbert’s food column in The Weekend Australian Magazine featured a recipe for Pappardelle with Broad Beans, so I thought I would make it using the orecchiette instead of pappardelle. The recipe also uses pesto, one of my favourite ways to enjoy pasta. You can usually whip up a tasty pasta meal without having to go to the shops. To this end a bag of pesto cubes in the freezer is a great resource for the busy cook. Towards the end of summer, when we have an abundance of basil in the garden, I start making pesto cubes in ice cube trays, tip them into a plastic bag and by the time I have finished I have a couple of kilos – enough to last till next summer. You’re right, I do have plenty of freezer space! The third main ingredient in this recipe is broad beans which I always have in the freezer. 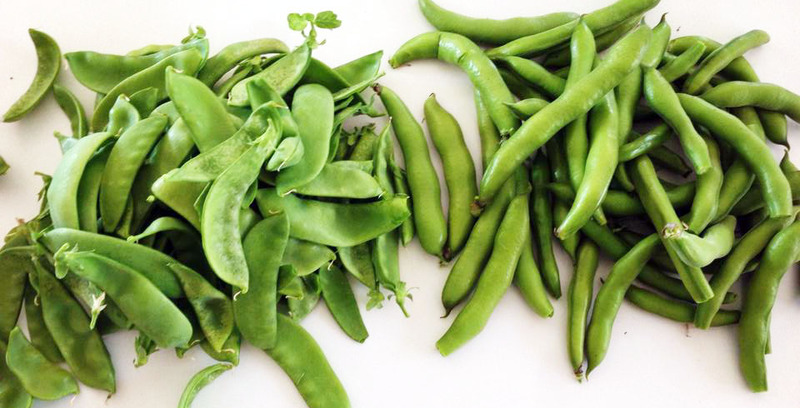 Fresh broad beans are delicious, but the season is very short and frozen ones are really very good. David Herbert used some green chillies in his pesto, but I prefer mine without. You could always add some to this recipe at the end, to spice it up a bit. A bottle of wine, a crusty loaf and maybe a rocket salad and dinner’s ready. Put two pans of salted water on to boil, one for the pasta and one for the broad beans. Cook pasta according to packet instructions and broad beans for about 3 minutes, then refresh under cold water and when cool enough slip off the outer skins and discard. While pasta is cooking make pesto by mixing all the ingredients together in a food processor until smooth. 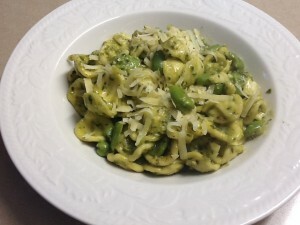 When pasta is al dente drain and return to the pan with the broad beans and the pesto. Mix well then transfer to four serving bowls. Sprinkle with extra grated cheese and serve. 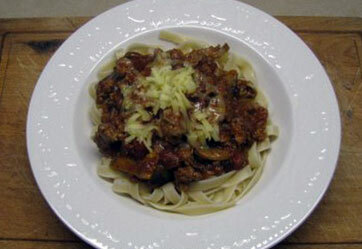 Everyone has a recipe for spaghetti bolognese, or “spag bol” as it’s fondly known in our family. My Mum taught me to make it when I was about ten, so I could probably make it with my eyes closed. This version includes lots of mushrooms, which in my view are an essential ingredient. I know it’s a bit “retro” to use an oxo cube, but it’s one of those recipes I’ve been making forever, it works, so why change it? I usually double the recipe which makes enough to freeze some for another day or you can use the leftovers to make a small lasagne. Heat oil in a large frying pan and cook onion and garlic until soft but not brown. Add mushrooms and continue to cook and stir for a few minutes until the mushrooms have softened and are starting to brown. Add the mince and continue to cook and stir, breaking up any large bits, until the meat is browned all over. Add tomatoes, a can of water (using the empty tomato can) and remaining ingredients. Simmer the sauce, stirring every five minutes or so, for 30-40 minutes, adding more water whenever the sauce gets too thick. You will probably use about 3 cans of water altogether. Serve with cooked spaghetti or fettuccine, grated cheese (Parmesan or cheddar or a mixture) and a mixed salad.